Today is my 4th Blogoversary. Four years is a long time in cat years. Why aren't I smiling? Cos I just looked at my very first post and saw there were NO PHOTOS of the World's Most Stunning Cat. That's what my blog was originally called. The World's Most Stunning Cat. Yeah, check this out. I guess that's why I only had 3 comments. I now have more control over my blog. I decide what gets published and when. When I say Jump; TW axs "how high?" I thank every one of my readers for reading and commenting. I want to implement some new features like letting you ax my questions. What would you like to ax me? Did you knowing Stunning Keisha now has a Facebook page? I'm also on Pinterest and YouTube and you all know I'm @CathyKeisha on Twitter. Glogirly has created buttons to make it easy to visit me everywhere. I'm also on Networked Blogs for your convenience. All this blogging and thinking is hurting my head. Now it's time for me to take my Sunday EZ. Catch you later! You ARE stunning and Glogirly is the bestest at bloggy stuffs. 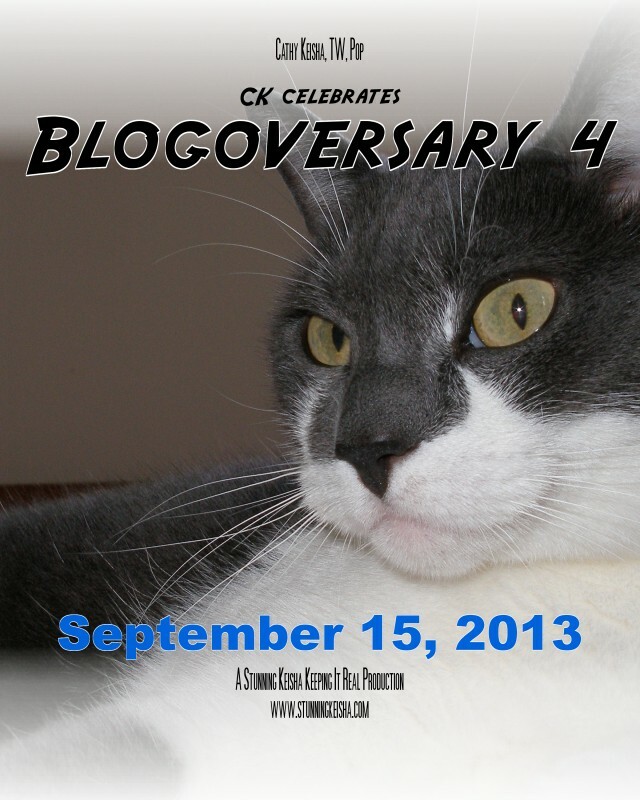 Happy Blogoversary, CK!!! 4 years is no small milestone...it's HUGE!!! We've enjoyed your blog so much, for so long...we're not even sure when we started following you! But you've certainly got us beat on first post stats. I'm pretty sure we had ONE comment. And Glogirly is the one that left it. HA! Wow CK, four years is a HUGE milestone. You've come along way and are still the most stunning cat! Our boys sent congratulatory smoochies and I'm going check that we following you all over. Happy 4th Blogaversary!!! Forget what TW told you, it's a big deal! Kittee...Kitzi. We're relieved TW and Pop decided to give you a real name. Happy Sunday, CK! Happy blogoversary, CK! It is a good thing you took charge - clearly you are the only one who knew what to do! Happy 4th Blog Anniversary stunning one. Hope you have a wonderful celebration. Have a totally PAWSOME blogaversary today CK - I hope your human decides to shower you with something other than a nip donut to celebrate....I mean REALLY! I must say after seeing your original post from "way back when" that you have gotten even MORE stunning than you were then (who'd have thought it possible?!). A very Happy Blogoversary to you CK. Sure hope you have a great day. That is a big one, 4 years. Sure glad you started blogging. We enjoy your posts. Take care. Happy Blogoversary! 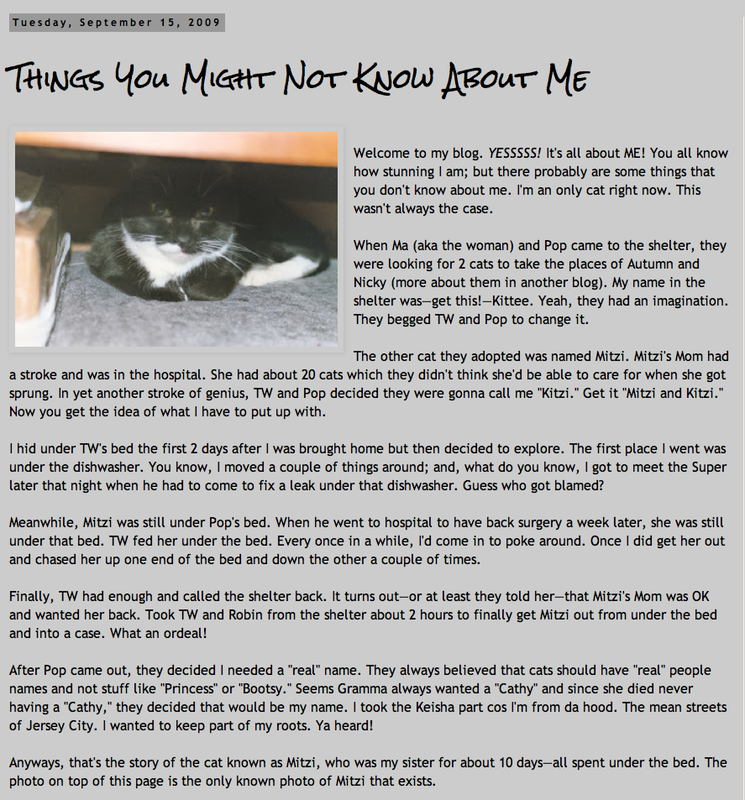 I am so happy I got to know you thru your catastic blog. Purry interesting story about your sis 10 days under da bed. Our Simba did that when we got him, it took him about 2 weeks before he would explore MOL. May you have many more stunning blogoversaries! Happy Blogoversary CK!!! You are in control, no doubt about that!!! Happy Blogoversary oh Stunning one! We loves following your coolness around the blogosphere! You go girl! Happy blogaversary, CK! We didn't know the story about Mitzi, and we're glad she was able to go back to her original owner so we could be the star all we know you deserve to be. And thank cod they gave you a "real" name. Shelters mean well, but they run out of good names after a while, and some of the monikers they attach to cats are just begging to be changed! Happy 4th Blogoversary, we are sorry things didn't work out with your sister. But we are glad she got to go back to her forever home. CK happy blogoversary! You're right 4 years is a long time in kitty years! We followed you on Twitter for a long time not knowing you had a blog! So many on Twitter don't blog, so our hooman just assumed...and we tell her all the time about assuming!!! But we are so glad that you do blog and we enjoyed your back story!!! Here's to many more years of blogging and social media! And you look maahhhvelous, darlink! You really do. Huge congratulations to you for you wonderful work. Happy Blogoversary. We drink a nip toast to another four+ years. Four year? FOUR YEARS? There's no way that that's small. A FOUR YEAR BLOGOVERSARY is gigantically huge! Really and truly it is. I haven't even half of that yet. May your day be filled with love & cuddles and treats & nip. Lots & LOTS of the nip! Lots & lots 'cause a four year blogoversary is something BIG to celebrate for sure. Concatulations CK from me and the Hotties and George. You are definitely stunning. Concatulations! 4 whole years is older than me! And I'm not saying that to be mean or anything. I'm saying that that is awesome! Happy Blogoversity! Happy, Happy Blogoversary - we'll toast you with a nipitini or two. CONCATULATIONS! on Your 4th anniversary blog year. Con-cat-ulations! So glad we met TW and got to follow what you're doing! Concats on your 4th Blogoversary! San Francisco is geographically pretty small, just under 50 square miles, with about 825,000 people stuffed into it, and no telling how many kitties and woofies. The population density is high but nowhere NEAR what it is in NY/NJ I am sure. The districts are smallish, though yours is very large and spread out--and full of thugs, heh heh. Just like you like it. Hope you got spoiled on your Blogoversary! 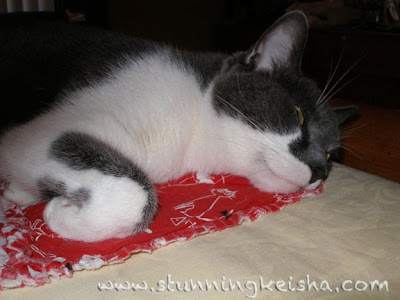 Happy Blogoversary Stunning Cathy Keisha. Happy blogoversary, Cathy Keisha! You are stunning AND totally in control. Here's wishing you many, many more blogoversaries, dear friend! Happy blogoversary! Taking over was a pawsome idea. Yay, Happy 4th Blogoversary you stunning girl you! Congrats and your blog is looking fab! Four years is NOT a "small milestone".....CONGRATULATIONS AND HAPPY BLOGOVERSARY! We will be celebrating our 4th in October and we don't think it's small! Concatulations on your 4th blogoversary. We've been going for four years too. Happy Blogoversary!!! We just love you, CK! Anyway I wan´t to wish you a HAPPY HAPPY 4th Blogoversary ! Happy Happy Blogaversary CK! What a pawsome milestone this is...Wishing you many more years of reporting on all the doings of the World's Most Stunning Cat! Sorry this is lat4 CK. Congratulations on your 4th blogoversary, THis MUST be a source of pride to you and the family, you hve a special cat, have a special blog and the world takes notice! Well done and may I raise a glass to the next four active, vibrant and STUNNING four years. We are LATE! Meow! But we are SO GLAD to know you and yes, a blog really needs a cats touch to keep it fresh and interesting. We're not sure how we missed this but Happy Blogoversary (even if it is belated)!